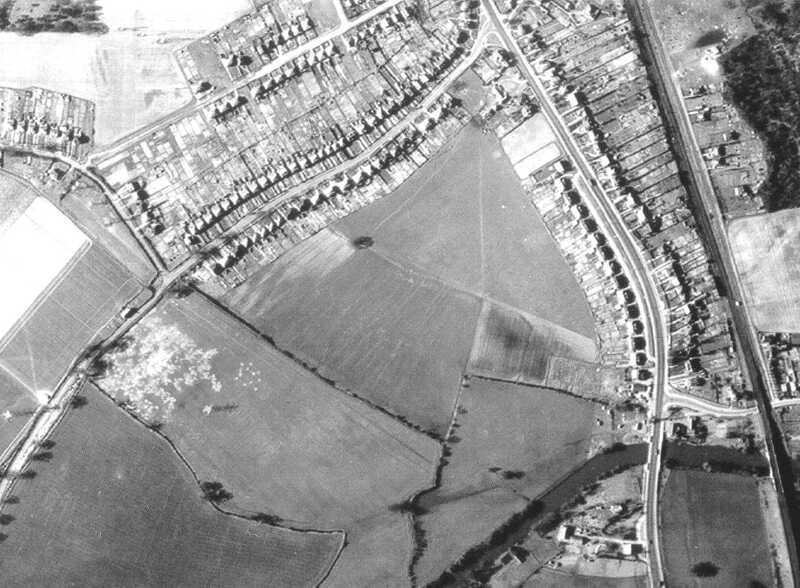 USAAF aerial photo of Carter's Hill and Winnersh, dated 8th March 1944, ref. 5045, by permission of National Monuments Record, English Heritage. This close-up of the south-eastern part of Earley shows the northern end of Mill Lane with Meadow Road at the top of the picture. Mill Lane is now severed by Rushey Way, and is now a side-road off Toseland Way. It appears that there had been some Army manoeuvres just below the junction with Gipsy Lane, because the field has extensive track-marks. Note the electricity pylons, which left large shadows. Scroll across to the bottom right-hand corner of the picture to see the railway line and Loddon Bridge Road with its low bridge. The A3290 by-pass now parallels the railway to the east. Just to the north of Loddon Bridge is the 'George', but of course there is no sign of the major roundabout and link-roads to the A329(M) and Lower Earley, nor the Cinema.